As we mentioned on the show, Preston and I recently took a business trip to New York City. We don’t travel all that often for business, but when the occasion presents itself we try to find time to investigate local opportunities to play pinball and arcade games in the wild. We were staying in Brooklyn and, as luck would have it, we found the famous borough to be fertile ground for classic coin-op gaming. Preston has already posted about two of the trifecta of arcade hot-spots we found in Brooklyn and I wanted share a little about the final one: The Satellite Lounge! The Satellite Lounge was the 3rd and final stop of the evening and we decided that we would walk the roughly 1.5 miles with the guidance of our smart phones, of course. As we walked through those unfamiliar neighborhood streets and crossed dark freeway bridges, I’ll admit this non-city boy was a little nervous. After all, we all remember the movie “The Warriors” right? I knew our trek through the nighttime concrete jungle was rewarded when we came to the front of the Satellite Lounge – a quant glass-fronted neighborhood bar with 2 rows of gleaming pinball machines calling to us from the street. Inside, a moderate crowd did what people do at a bar. 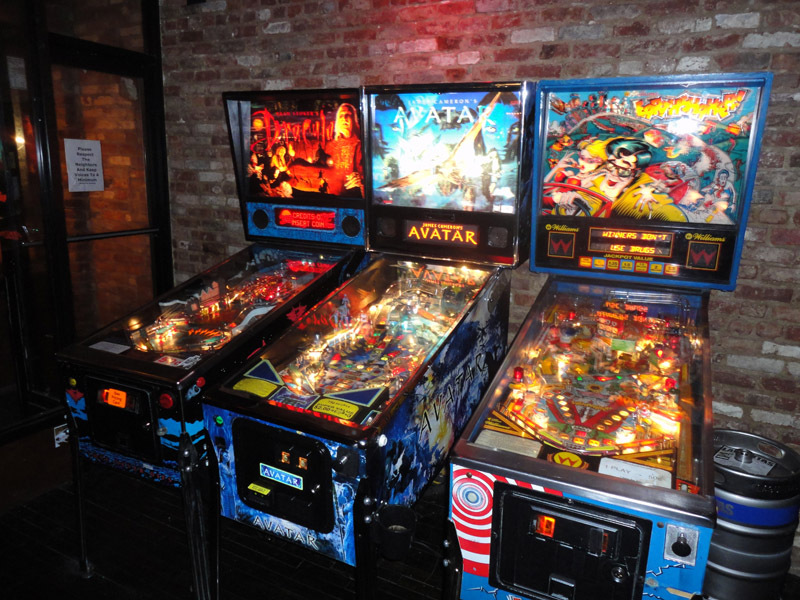 To my surprise, all of the pinball machines were occupied – when was the last time you saw that outside of a pinball centric event? My pals and I grabbed some adult beverages and spread out to get into quarter feeding position. Preston and our buddy Shannon headed for Stern’s Indiana Jones and I went to the Avatar Machine. 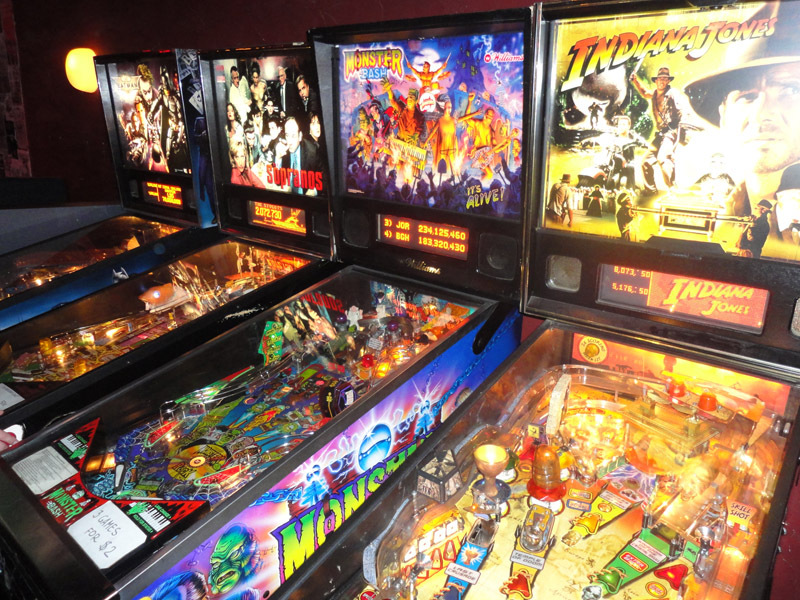 The Lounge also features games such as The Sopranos, Monster Bash, Bram Stoker’s Dracula, Batman (The Dark Knight), and Earthshaker. After my 2nd game on Avatar, a gentleman approached me and asked if I would like to play him in Avatar. Sure! Those of you who have seen me play pinball will not be surprised when I tell you that I played for about 90 seconds total. My opponent, however, totally kicked it and played about 10 minutes. Gracious in winning, he and I chatted about all things pinball. His name was Francesco La Rocca and I learned he was one of the most active members of a local pinball league in Brooklyn. He introduced me to the other folks around and it turned out that most of them were league players, as well. For the rest of the night we went from game to game enjoying the very social nature of pinball. In the end, I found The Satellite Lounge to be one of those local establishments where everyone seemed to know each other yet they were more than happy to have strangers stop by to visit their little corner of silverball bliss. The machine selection was outstanding and well-maintained, the beer was cold, and the patrons were passionate about their pinball. So the next time life takes you to the Big Apple, head on over to Brooklyn and the Satellite Lounge! Great find & great article guys! !